It didn’t feel anything like the scenario I’d imagined when we finally met our girl. I imagined us being ready hours before she came, wearing the outfit I’d chosen weeks before, my hair and makeup nicely done. I pictured us pacing around the guesthouse, peeking constantly through the curtains, rushing out the door as soon as we saw their car enter the gates. I imagined her stepping out of the car, directly into our arms, and lots of happy pictures taken against the lovely guesthouse gardens. Instead, they’d arrived a day early, unexpectedly, while we were napping. So I hurriedly ran a brush through my hair and another one over my teeth as I tried to shake the cobwebs from my sleep-slurred mind. I glanced into the suitcase at my wrinkled, chosen outfit, then in the mirror and figured what I was wearing was good enough –I wouldn’t want to make them wait any longer for me to change clothes. I still couldn’t believe this was happening NOW and not at all the way I planned it. I hadn’t planned to feel shocked or panicked when it was time to meet her. But that was exactly how I felt as we stepped nervously down the stairs. Donnie rounded the corner into the living room first. The pastor stood up, laughed and said, “Am I finally meeting my brother?” Their embrace blocked my view at that moment, but I took one step more and a blur rose from the sofa in front of me. The next thing I know, a soft voice exclaimed, “Mommy!” as thin brown arms wrapped tightly around my waist and I wrapped my arms around her. She laid her head against my chest and I rested my chin on her head. We just stood there like that for quite a long time, a hug that had been building up within us both for two long years. And the shock and panic melted away and that was how I met my daughter. Her birth mother (I’ll just use her initial, “H”) was there, too, and she was truly lovely. Very quiet and gentle in countenance. She speaks very little English, so we shook hands and then we all sat down to visit a bit. 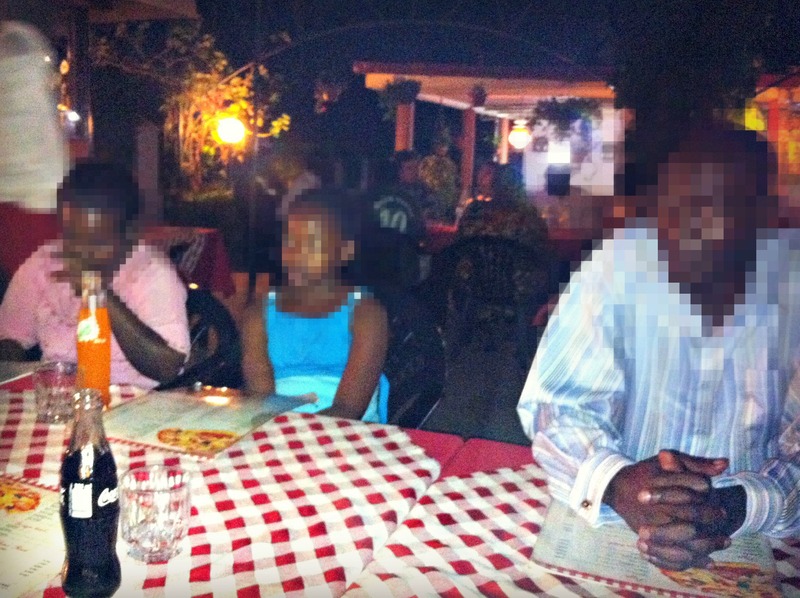 Since dinnertime was drawing near, we called our driver, Francis, to come take us to a local outdoor pizza restaurant that was suggested by the guesthouse staff. We also had to stop by another guesthouse so that I could pick up some malaria medication from a friend, to last us until our missing suitcase arrived. First, H and Pearl wanted to shower and change clothes. Donnie and I took a few minutes to properly freshen up, then we waited for the other girls in the cool night air, Donnie chatting with the pastor while I chatted with Francis. I shared with him how many things had gone not according to plan so far, and he just smiled his mile-wide smile and reminded me that God’s plans rarely fit the agenda we create for ourselves. My eyes started tearing up, as this man has the purest ministering spirit I’ve ever witnessed in a human being. I’ll never forget what he said to me that night, and will always remember it in his beautifully accented voice. “We serve a BIG God!” He waved his long arms wide and smiled, “He made a universe SO big, it has no end!” His peace and joy was truly contagious and I began to see our evening for the adventure it was sure to be. 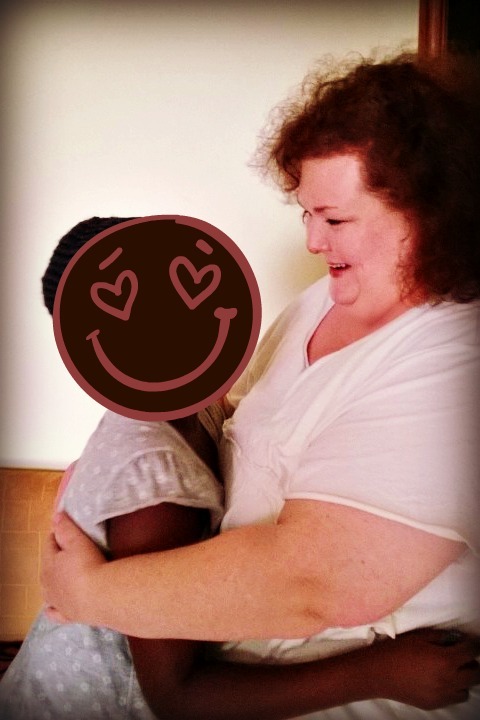 The brief visit at the other guesthouse was wonderful, as I met in person other adoptive moms I’d only known through Facebook. You’ve got to love Facebook, though — it’s an amazing thing to meet someone for the first time but feel like you’ve known them for ages! Some of them also knew Francis, so it felt like a fellowship of old friends instead of a first meeting of strangers. We soon left for the restaurant, and were seated in a lovely little courtyard under some trees. I was surprised by the lack of mosquitoes — you’d think there would be swarms of them everywhere from the stories you hear about Uganda. We ordered sodas for everyone and two large chicken/pepper/onion pizzas to share. I admit to feeling skeptical about eating the food, but I didn’t know how I couldn’t. And I figure it’s been in a hot stone oven–surely that would kill anything, right? When the food came, the pastor suggested that I should serve my sister, “H”, as according to their custom. I certainly didn’t mind doing this, but it was unexpected and as I rounded the table I was silently praying, “Lord, please don’t let me miss this up!” There wasn’t a spatula to serve the pizza, so I had to use a fork, and it wasn’t cut all the way through, so I clumsily stabbed the slice, wedged it free and placed it on her plate, all the while kind of laughing nervously and looking like a total klutz, I’m certain. Then I didn’t know if I was supposed to serve Pearl, too, so I did, and then the pastor (who I now know should’ve been next before our daughter). The whole time my husband has this amused yet “I’m-glad-it’s-you-and-not-me” expression on his face, and I quite wanted to smack it right off him! OH I felt like a doofus! I sat on the end of the bed and got all weepy with Donnie, because I’m just wired like that. I can meet an unexpected situation head-on and do what needs to be done, but I have to process through it later. He reassured me that the evening HAD gone well, that H probably was NOT regretting her decision to trust a couple of dumb Americans like us with her daughter, and that tomorrow would be a beautiful day spent getting to know one another. My stomach was churning, but I have IBS, so I figured it must be a manifestation of stress, like usual. I took my IBS medication, and some Pepto, put on my gown and went to bed. Except the IBS medication didn’t work…even though it almost always works…and as the wee hours of the night descended upon us, I began to feel worse and worse….